WMS Gaming are renowned for replicating some of the best musical themed slots but this one just may top them all, Welcome Kiss Slot! That’s right, easily the most iconic 70’s rock’n’roll band, Kiss changed the art of performance for ever with their fire breathing antics and widely recognisable painted faces. WMS understand that such an influential band deserves a slot that is larger than life, so they have decided to make this project a 100-payline whopper! In addition to this the developers have decided to split this huge pay line over two separate reels: one is a 5×4 grid and the other is a 5×12 grid. You have to see this to believe and when you start playing it may change your opinion about multi reeled slots forever. This structure has been seen before and we tag each project that includes this with the trademarked ‘Colossus Reels Feature’. Players can expect to see all of the usual Kiss memorabilia within the slot, with each band member and the usual card symbols filling both reels. The larger set of reels actually includes ‘stacked symbols’ which actually stretches across the entire column, increasing the chances of hitting a winning line remarkably. Visually the entire game is very pleasing and relatively easy to play thanks to WMS’ brilliant styling approach making all major playing buttons are be easily found despite the complex reel design. Kiss enthusiasts will be also pleased to know that there are original snippets from all their major hits used throughout the slot. The games ‘wild’ is represented by The Kiss Band symbol and substitutes for every other symbol within the game. It is surprising to see a wild symbol in such a large sized slot, but luckily for players this can be the difference between a zero return and sizable pay-out. Players should look out for the Kiss bonus symbol as this is the key to the slots awesome free spins round. The Kiss logo appears on reels 1, 3 and 5 of both the main reels and Colossus reels and triggers the free spins round plus a neat multiplier for good measure. Spinning 3 Kiss logos will give you 8 free spins + 2x multiplier; 4 kiss logos awards 12 free spins + 5x multiplier and 5 logos gives players a massive 20 free spins + 20x multiplier. 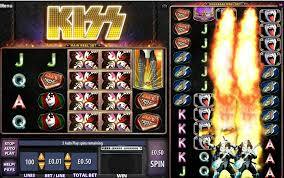 For such an exclusive slot, Kiss provides fans and slot enthusiasts a truly authentic game to get stuck into. The unique structure does take a little time to get used to so maybe players with smaller bank rolls should sit this one out.